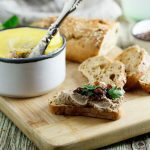 Appetizer Chicken Liver Mousse with Brandy and Bacon | What Goes with What? Melt a ¼ cup of the butter in a large frying pan, stir in onion and bacon or pancetta, and sauté until onion is translucent and then add chicken livers, (orange zest if using) and thyme leaves. Cook over a medium heat until livers are no longer pink on the outside. Season with salt and pepper and, then add port, brandy and cream. Bring to a simmer, cover and remove from the heat. Process the onions, livers, brandy and seasonings in a food processor until thoroughly puréed. Add the remaining 1 ¼ cups softened butter in fourths, pulsing briefly after each addition. Spoon the mousse into small tureens or ramekins and chill until solid (at least an hour) before serving. Sprinkle with chopped parsley if desired and serve with toasted baguette slices or a neutral flavored cracker.